The Sauropoda, those long-necked herbivores of the Dinosauria have attracted a great deal of research recently. These creatures, the first truly large terrestrial animals, bigger than extant species today, evolved in the Triassic and went onto to form a significant proportion of the plant-eating animals in a number of ecosystems for the next 150 million years or so. Although, the Ornithischians during the Cretaceous were more numerous and diverse, the Sauropoda persisted right up to the end of the age of the dinosaurs and some genera represent the largest land living animals of all time. Body weights in excess of eighty tonnes are frequently cited and some of these leviathans, dinosaurs such as Alamosaurus, Argentinosaurus, Andesaurus and Antarctosaurus (just to focus on Sauropoda being with the letter “A”), may have reached lengths of more than thirty metres. A number of research teams have explored gigantism in the Sauropoda in a bid to understand how and why these reptiles were able to grow so big. At the Society for Vertebrate Palaeontology meeting being held in the USA this week, a number of papers will be presented. Some of these papers explore this subject area, but one study undertaken by Dr. Donald Henderson (Curator of Dinosaurs, at the Royal Tyrrell Museum, Alberta, Canada), deserves a special mention. Dr. Henderson asked an intriguing question, the long-necked dinosaurs by definition are known for having long necks, could these long necks have helped to regulate the body temperatures of these colossal animals? One of the enormous (no pun intended), difficulties with the Sauropoda, is that, there are no land animals alive today that come even close to matching them in size. The body proportions of a Sauropod, its body shape and its anatomy are very different from any living relative of the Dinosauria, so using extant species as comparators is effectively ruled out. Large animals such as elephants and Sauropods do share a common problem – how to lose heat, how to stop their bodies overheating. Small animals, even those that are endothemic (warm-blooded), have a high surface area to volume ratio. They can lose heat rapidly and can struggle to maintain body temperature. The giants of the animal kingdom, today’s elephants and the Sauropoda of the Mesozoic have the opposite problem, their large bodies helped them to retain heat, maintaining a core body temperature that was different to the surrounding temperature of the environment. 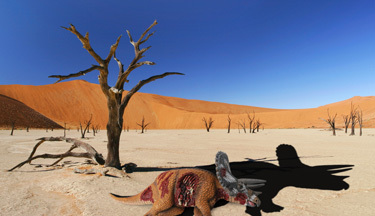 How did the Sauropods stop themselves from overheating? The problem is compounded by the ongoing debate as to whether the Sauropoda were warm or cold-blooded. Putting this debate aside for moment, large animals such as thirty metre long Diplodocus would still struggle to lose heat and avoid the trauma and physiological damage to its organs if it did not find an effective way to cool down. African elephants are able to use their large ears as radiators to help them remove heat from their bodies. The ears of tropical elephants are much larger then the ears of their long extinct, cold adapted cousins the Woolly Mammoths. The ears of the African Bush Elephant (Loxadonta africana) are very well supplied with blood vessels and are very effective at helping to cool these animals down, as proved by many infrared thermography studies. The long necks of the Sauropoda, as well as acting as extremely efficient food gathering devices and allowing access to food resources that other herbivores could not reach, may also have served a similar physical function to those large flapping ears of today’s biggest land mammal. Dr. Henderson calculated the surface area to body mass proportions of a number of different types of Sauropods. In total, sixteen computer generated models were created, some based on early, basal Sauropods such as Shunosaurus from China, whilst other models represented Diplodocoid Sauropodomorphs such as Nigersaurus (from Niger, Africa) as well as Apatosaurus and Diplodocus from the United States. Other types of Sauropod studied included members of the Macronarian Sauropodomorphs (big noses). This group included the likes of Camarasaurus and Brachiosaurus. In addition to this, the study looked at juveniles and their body shapes in comparison to the adult animals. The smallest specimen studied was a juvenile Camarasaurus estimated to weigh less than 700 kilogrammes, the largest specimen used in the study represented a mature Brachiosaurus. Dorsal and lateral views of the taxa used in part of the study. The diagram above shows: (A) Camarasaurus lentus, (B) Haplocanthosaurus priscus, (C) Saltasaurus loricatus and (D) Brachiosaurus brancai. Although a number of assumptions have had to be made, for example, the metabolic rate of Sauropods is not known and there is also a great deal of uncertainty surrounding the biology of these reptiles, Dr. Henderson was able to draw some interesting conclusions from his research. The physical length of the necks did alter surface area to body mass and volume ratios, thus suggesting that the long neck could have been used to assist in thermo-regulation. In addition, the presence of air sacs in the neck and trunk when considered in conjunction with the active blood flow between the core and surface of the body make the long neck radiator theory certainly plausible. It is also worth considering the position of the neck, although not held in the “swan-like” pose so favoured by earlier restorations, the necks were a long way off the ground in large individuals. The necks would have been exposed to any cooling breeze and any air currents circulating – these too would have assisted with any requirement to lose heat from the body. Dr. Henderson, considered the function of dermal spines that have been found in association with some Sauropod fossils and their role in helping to regulate body temperature. Sauropod specimens assigned to the Diplodocus genus had a row of dermal spines running from the neck down the back and along the midline of the tail. There is the intriguing possibility that these spines could have significantly increased the body surface area of these dinosaurs and therefore aided heat loss. To test the role of these spines in thermo-regulation, a Diplodocid model was generated, one with a set of dermal spines running almost the entire length of the body. The height of the individual spines was based on the relative position of each spine in association with the vertebrae. The largest spines were estimated to have been around forty centimetres tall. The Dermal Spines of Diplodocus – What Effect on Cooling the Body Would These Have Had? Did the dermal spines of some Diplodocoids act as radiators? The precise location of these spines is still debated. In this study, it was assumed that cervical, dorsal, sacral and caudal vertebrae all had dermal spines associated with them. Dermal spine arrangement used in the study. For the sets of dermal spines along the tail, trunk and neck body segments their combined surface areas amounted to 7.94 square metres. The total surface area of the body and limbs of the Diplodocus model was calculated to be a little under 68 square metres. Based on this model, the full dermal spine area represented 11.7% of the actual body area. If these spines were well supplied with blood vessels (as seen in the elephant ears), then they would have a significant potential to act as radiators, helping to cool the animal down. However, Dr. Henderson did point out the speculative nature of this aspect of his research. There is a great deal of uncertainty about the size, internal structure, and distribution of these spines on the bodies of these types of dinosaur. Until better fossil material becomes available, the importance of any dermal spines for heat loss in Sauropods will have to remain very much open to speculation.